Mocha Pro: plug-in or standalone application? Q. What Mocha Pro option should I buy, the plug-in or the standalone application? What is the difference between the Mocha plug-in and standalone? A. For most Mocha Pro users, the plug-in is the best choice for usability and integration with your host application, below are some situations where you might want to use the standalone application. Large roto projects or assistant stations. Some of our customers have a large number of roto artists, who only do roto. How do I set up the Imagineer License Server on Linux with systemd? systemd is the new mechanism for managing startup services on modern Linux distributions. The Imagineer License Server can be configured to use systemd instead of legacy init scripts for managing the server process. Boris Continuum Complete for Avid Media Composer, FCPX or any OFX supported host (Nuke, Resolve, Vegas, etc) is NOT currently supported for macOS Mojave (10.14). Please refrain from updating to this new operating system if you plan on using the Continuum suite of plug-ins. Continuum continues to work as expected in macOS 10.11 (El Capitan), 10.12 (Sierra), 10.13 (High Sierra). Please refer to the Continuum compatibility matrix for further information. Why does my Sapphire trial have a red X? The Sapphire trial version is a fully functional 30-day trial watermarked with a red X. There are ways to handle a known issue in which users, using Dual-Monitor setups on Windows 7, sometimes experience crashes if they use Mocha, when closing the plugin and going back to Avid. How Do I Paste 3D Camera Solve Data into Adobe After Effects? Continuum premium filters like Primatte Studio and Stage Light are available for purchase as an individual filter. Check here before you install a premium filter in your host application whether it is Adobe, Avid, OFX, Resolve, or another host platform so that you are aware of important compatibility issues. My favorite host application supports OFX plug-ins, will Sapphire work? Have a question about the Boris FX Continuum VR Unit giveaway? We’ve compiled questions here about host compatibility, technical support, licensing, and more. How Do I Access the Sapphire Documentation? How Do I Find My Machine ID (Host ID)? How Will I Be Notified of Complimentary Software Updates (Point Releases)? How Can I See Which Machine(s) Are Currently Using My Floating License? To see a list of machines currently using your Floating License, open the RLM server’s web interface using a browser. From the server machine go to http://localhost:5054. On the left side of the main page, select “Status”, then, go to the ISV Server table at the bottom of the screen and click “Get License Usage”. There you will see a table with the Host Name and Host Id of every machine using the license. One Sapphire spark aborts when first loaded, although the others work fine. Where Can I Download the Sentinel Drivers for My USB Dongle? Learn where you can find the Sentinel Drivers and SuperPro Framework for your USB Dongle here. Why Is the Sapphire Preset Browser Not Opening On My Mac? Why is Sapphire's Builder Only Available On Some Hosts? Will Sapphire use multiple GPUs if I have more than one? Will projects saved with prior Sapphire versions continue to work with Sapphire v11? Can I use the same activation key on multiple machines? You can use the same activation key on different machines provided you have enough number of fulfillments per activation. For instance, if you have an activation key for one machine, you can only activate it on one machine. If your activation key allows more than one activation, you may activate it on that many machines. Do my Sapphire installs need to be the same version on both the GUI and render machines? Yes, they do. You will need to either update your installer on both your GUI and render machines to the most current version, or install an older version. Does Sapphire Work Under Autodesk Central Installation? Unfortunately, this configuration is not supported at this time. Please contact Sales for more information. How Can I Delete Precomputed Clips In Avid? How Can I Process a Title or Key in Avid Without Affecting the Background? How Can I Promote Avid Sequences with Older Sapphire Versions to v11? How Do I Deactivate My Sapphire Activation Key? How Do I Uninstall Sapphire From My Current Machine? Learn how to Uninstall Sapphire from your computer. How can I load Autodesk Setups from Prior Sapphire Versions into Sapphire 11? How can I upgrade old presets to v11 in Avid? How do I Stop Sapphire From Collecting Usage Data? How do I return to my previous version of Sapphire? First, uninstall Sapphire from your machine. Then, install Sapphire using the older installer and re-enter your license. Please note however, that your Sapphire v11 license is not compatible with Sapphire v7 and older. Furthermore, please be advised that projects saved using Sapphire v11 will not open in older versions of Sapphire. I just installed a new version of my host application and Sapphire is not showing up. If you install a new host application on your machine, you will need to re-install your plugins afterwards, so the new application can locate them. Where Can I Find the Sapphire Diagnostic Log? Boris FX releases new versions of Continuum regularly. Find out about the new filters, effects, and features that have changed in Continuum 11 through Continuum 8. From new filters to effects to GPU acceleration to improved motion tracking and more, get information here about the upgrades that have happened in Continuum since version 8. A prior crashing issue with Mocha AE and Adobe After Effects has been resolved as of January 2018. See which hosts are supported for Boris FX VFX plugin, Continuum 2019, including The Foundry Nuke, Adobe After Effects, Adobe Premiere, Apple FCPX, Apple Motion, Avid Media Composer, Autodesk Flame, Blackmagic Davinci Resolve, Magix Vegas Pro, and HitFilm Pro. View the supported hosts specs for Sapphire 11. This chart includes specs for The Foundry Nuke, Adobe After Effects, Adobe Premiere, Avid Media Composer, Autodesk Flame, Blackmagic Davinci Resolve, Blackmagic Fusion, Magix Vegas Pro, Sony Catalyst, Silhouette, Grass Valley Edius Pro, SAM Rio, ToonBoom Harmony, and Filmlight Baselight (versions 4.3 and 4.4 only). Imagineer Systems, GenArts, and Boris FX joined forces in 2016 to deliver our customers awesome VFX plug-ins together. As we are one company now, we are consolidating our systems and resources. Which Sapphire license do you need? Wondering which which Sapphire license will work best for your needs? View our cross-host license matrix for more information about hosts and licenses. What are the installation instructions for Sapphire offline activation? How to install a Sapphire activation key if your machine or license server machine is not connected to the Internet. Is there a list with descriptions of the Sapphire effects? Are Sapphire Units perpetual licenses or subscription? Sapphire Units are offered as perpetual (node-locked) licenses only. Subscription pricing is offered for the full Sapphire suite only. Do I need an internet connection to license a Sapphire Unit? Yes, you need an internet connection to license a Sapphire Unit. Offline license activation is not supported for Sapphire Units. If you require offline activation, you need to license the full Sapphire suite. What do we do if we don't want to use Quicktime on Windows? If users have security concerns and do not want to use QuickTime on Windows, but still want access to .MOV and .MP4 codecs, we recommend that they uninstall QuickTime Player, and install only the QuickTime Essentials part of the package. This substantially reduces the attack surface and reduces QuickTime to the status of a faceless library on their system which will only be used inside of other software for codec decoding. How do I install Mocha Pro 5 on Centos 7? Does Boris FX support Monsters GT? Monsters GT is no longer supported. Follow these instructions to uninstall it. Q. I am not sure the differences between your products. Which do I choose? A.With the Mocha Pro 5 release we have simplified our offering. Choose from the Mocha Proplug-in or standalone options. The compare products chart shows the differences between Mocha Pro 5 and the Adobe & HitFilm bundled Mocha products (Mocha AE / Mocha HitFilm). Q. Do I need the standalone or the plug-in option? A. 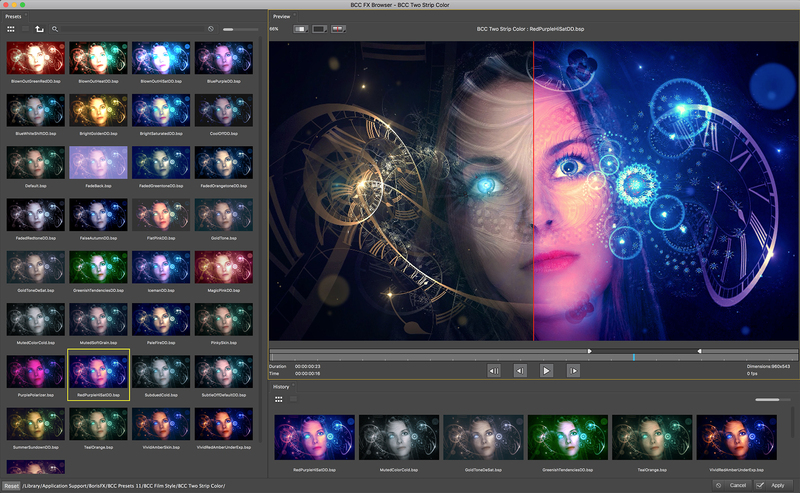 The standalone and the plug-in option share an almost identical feature set and the ability to export tracking and roto data to most popular formats. What are the advantages of Soundbite over products that create a transcript? Boris Soundbite does not create a transcript. The process of making audio searchable in Soundbite is referred to as Indexing. The indexing process generates a record of the sounds in the audio - known as phonemes - and stores this information on your computer. Rather than making decisions about the words that are spoken at the time the audio is indexed - resulting in a transcript - Soundbite locates areas in the audio that sound exactly like or similar to the words or phrase being searched. Q. I own Mocha Plus, why is it no longer on your site? A. Imagineer has recently stopped selling Mocha Plus, but it can still be downloaded from our downloads section. Customers that own a Mocha Plus license will be rewarded with a special upgrade discount to Mocha Pro 5. The list price of Mocha Pro 5 Plug-in for Adobe is $695. Mocha Plus owners can upgrade to this product for $395. Subject : Title 3D Crashing Issue : Title 3D crashing Final Cut Pro when applying, launching or rendering. Steps to work around the issue: 1. Quit Final Cut Pro and go to this location in the Finder -Macintosh HD :: Users :: [ Current User/Home ] :: Library** :: Preferences 2. Inside this location, delete the file that reads: “com.borisfx.Title 3D” 3. Inside the same Preferences folder, enter the Final Cut Pro User Data directory and delete these two files: ʻFinal Cut Pro Obj Cacheʼ & ʻFinal Cut Pro Prof Cacheʼ After this, re-launch Final Cut Pro and Title 3D should be operational again. Subject : BCC Suddenly Having Problems On Windows Issue : My BCC Is Suddenly Experiencing Problems On My Windows System; Reinstalling Does Not Help Cause : Recent Changes, Manual Or Automated, Have Caused A Corruption in BCCʼs Behavioral Protocols How to Get Around the Issue : 1. Close your Host NLE/Compositor program and go into this directory - C:\Users\[Current User]\AppData*\Local\BorisFX 2. Inside here, you will see a folder for Boris Continuum Complete -- send this folder to the Recycle Bin and re-launch your NLE/Compositor program. Subject : One Frame Watermarks on BCC AVX 9 on Mac Issue : When I render my BCC AVX 9 effects, each effect has a watermark on the first frame. This isnʼt visible before render, and the BCC AVX 9 software is fully licensed. Cause : Problematic Build How to Get Around the Issue : This is a known problem with one particular Installer build that was sent to multiple channels. Subject : M100 Errors -39 and -2048 Issue : When Working In Media 100, Suddenly I Am Seeing Errors That Read Error Code -39 and/or -2048 How to Get Around the Issue : These two errors will come up, usually together, when there is a problem with Quicktime playback. To clarify the nature of these messages: Error -2048 is actually a Quicktime error, not a Media 100 error, stating that a clip cannot be loaded; Error -39 is the same error, just using a Media 100 numerical code, relaying the same problem. Subject: BCC Installed but Not Applying in Final Cut Pro X Issue : When I apply a BCC effect in Final Cut Pro X, I see a red screen with a yellow triangle showing an “!” symbol. The effect parameters load but the video is gone, and the effect does not appear either. Cause : When BCC loads within Final Cut Pro X, itʼs actually loading Motion Templates rather than the BCC effects themselves. Subject : BCC AVX crashes Avid on launch with Segmentation Fault error Issue : When launching Avid Media Composer after installing BCC AVX, Avid crashes with the following error: error while trying to \Initialize AVX2 Host\ pop up appears and reads: \Segmentation faut\ in thread \MainThread\, at address 0x0 Cause : This would be due to BCC attempting to load a hardware asset that is no longer present -- the most common reason would be if CUDA-based hardware was removed from the system, but the drivers for this hardware were not uninstalled. Subject : Poor Performance with Static BCC Wild Cards Effect Issue : When Previewing or Rendering Static Instances of BCC Wild Cards, The Performance Is Notably Slow Cause : The BCC Wild Cards Is Processing Unnecessary Information How to Get Around the Issue : During Preview at least (and possibly during Render), dis-engage the Anti-Aliasing function completely. Turn off the Motion Blur if enabled. Subject : Boris Effects Misaligned After Rendering From Sony Vegas Issue : When I render my timeline from Sony Vegas, my effects have changed position. My Vegas timeline is a custom size. Cause : When the render carries out, the raw media automatically adjusts to compensate, but the effects do not. Note: Even if your Vegas timeline is an SD/HD standard, this can happen if you render/export to an alternate resolution. Subject : Boris RED/FX does not launch as Transition in FCP. Issue : When user applies Boris RED/FX as a Transition in Final Cut Pro 7, the plugin is recognized but when called upon from the Viewer window, the interface does not load. Cause : Intermittent limitation of old-style plug-in architecture. Steps to work around this issue : NOTE: Any one of these might be enough to get the interface to load, so it might work before you reach the end of list below. Subject : Jagged and/or Flickering Titles Made by Boris RED/Graffiti Issue : My Titles Made in Boris RED/Graffiti are Jagged and/or Flickering When Rendered in My Host Application. Cause : There are two settings in Boris RED and Boris Graffiti that re-adjust fields to optimize both vector and extruded text - Usually These Are Disabled, Causing These Problematic Renders; In Rare Cases, however, Having These Enabled Will Cause a Render Problem. Subject : RED/Graffiti Crashing on Launch Issue : RED/Graffiti is crashing host upon launch, as well as when attempting to launch as a stand-alone program. Cause : Problematic Fonts unable to successfully initialize, causing an interruption of launch operations. Steps to work around the issue: 1. Primarily, you want to force most of the Filters on the system Offline. 2. If you are using Mac OSX, close as many programs as possible and launch the FontBook application. Subject: Boris Displaying in My Operating Systemʼs Language Instead of English Issue: My OS (Mac/Windows) is a non-English OS, and after installation, my Boris product is displaying in the same language as my OS. Instead, I want my Boris product to display in English. Cause: The Boris installer, detecting the non-English nature of the Operating System, installed a Translation file to translate the program to the Operating System's current language settings. Subject : BFX Error -28 Issue : When Working with BCC, Sometimes I See An Error That Reads ʻBFX Error -28ʼ Cause : This Is A Broad Error, But This Generally Indicates A Strain Of Available Resources For Preview Or Render How to Get Around the Issue : Your primary objective will be to remove any strain on the CPU, GPU or RAM usage when it comes to the BCC operations. Add the project to the Render Queue: In the Render Queue twirl down the Output Module parameter and click on Lossless: In the Output Module window select Format Options: In Format Options select the codec that best suits your needs: Back in the Output Module check the box next to Resize, open the Resize to dropdown menu and select the size and frame rate that works for you: Hit okay, select your render destination, and start your render. Subject: Moving from earlier versions of Adobe to Adobe Creative Cloud. Issue: Manually moving plugins from older versions of Adobe apps to Adobe Creative Cloud. Cause: Adobe’s Creative Cloud update requires migration of Boris Plugins to work with them. Steps to work around the issue: For Mac OSX Users: For BCC/FEC – Open Macintosh HD: Library: Application Support: Adobe: Common: Plugins: CS(whatever your current version is): Media Core Copy the plugins Paste into Macintosh HD: Library: Application Support: Adobe: Common: Plugins: 7. My activation keeps failing. What do I do? Make sure you click "Verify" before you click "Activate" in the registration window or the message "activation failed" will appear. If you have a firewall set up, you may not be able to connect to the Boris FX server resulting in the "activation failed" message. You may want to modify your firewall to allow your system to contact our server or, as an alternative, use UPID activation. Thank you once again for your Boris FX Purchase. My system crashed… How do I get my license back? Serial number activation: Contact Boris FX Customer Service - customerservice@borisfx.com or 857-488-3572. A team member will verify your purchase and help you reactivate your license remotely! UPID activation: Submit your UPID to Boris FX Customer Service - customerservice@borisfx.com or 857-488-3572. Your UPID will be verified, processed, and an unlock code will be provided for activation. Serial Number Activation: Open the Boris FX registration window, and hit "Deactivate." Uninstall the product. Reinstall the product on your new system. Enter the serial number in the registration window. Click "Verify" and then "Activate". For detailed instructions, click here UPID activation: Contact customerservice@borisfx.com or call 857-488-3572 with your UPID # Once your UPID has been processed, you will be sent an Unlock code. Open the registration window and enter the Unlock Code. What are Mocha's system requirements or technical specifications? How do I fix a 'can't connect to server' or 'server system is down' error when I know the server is running? For the -97 error, it's likely that a port number is conflicting. You can edit the server license to fix this. Normally the license server runs in port 27000, but if other FLEXnet license servers are present it may take a different port (Nuke and Maya are common FLEXnet processes that may conflict with Mocha and eachother). To be safe, open ports 27000-27009. Also, the vendor daemon uses a port specified at run time. Does Mocha use multi-threaded processing? We only multi-thread some of the processes in Mocha at this time. Performance improvements are on the development list to speed up a lot of the workflows.We will let our users know when we are able to utilize multi-threadding on all of our processes, but that will take time to implement. Why am I getting the error code: 'Could not decode product name from...'? That is caused by trying to use the incorrect activation code for you Mocha product. Make sure you have double checked your activation code, and make sure you have the right version. You usually see this when you have used license manager 1.2.5 for Mocha V4, are trying to activate a Mocha V3 software with a Mocha V4 code, or have substituted Mocha Pro for Mocha Plus. Will Mocha run on OSX Yosemite? In general, as we don't use the latest OSX updates for "signing" Mocha, Yosemite is not totally green lit to run Mocha. This means Mocha's ability to run on Yosemite depends on the users' security settings (which apps you allow to run on OSX). Yosemite will initially not allow Mocha to run, it is up to the user to navigate to "Security & Privacy Settings" and choose to allow Mocha to run anyway. Why can't I find 'Program Data' or locate my Mocha license on my machine? If you can not find the following paths on your machine: Licence Directory for OSX: -/Library/Application Support/Imagineer Systems/FLEXlm/Licenses/ Licence Directory for Windows Windows XP: C:\Documents and Settings\All Users\Application Data\Imagineer Systems Ltd\Licensing\ Windows Vista: C:\ProgramData\Imagineer Systems Ltd\Licensing\ Windows 7: C:\ProgramData\Imagineer Systems Ltd\Licensing\ (Legacy versions of Imagineer Software may still use the directory C:\Program Files\Imagineer Systems Ltd\Licensing\) Licence Directory for Linux /etc/opt/isl/licences/ You probably need to make sure that you are able toview hidden folders on your computer. Why won't my shape track or move in Mocha? This may be a conflict with your video card. If your shape is completely stationary, try going to Mocha and select File>Preferences. Once preferences is open, navigate to the "Open GL" tab and check the checkbox "Disable Offscreen Buffers." Now try tracking again, your shape should follow the track properly. How do I share my custom keyboard shortcuts? How do I open Mocha Plus or Mocha Pro from After Effects instead of Mocha AE? If you own Mocha Plus or Mocha Pro, you can open these products from within AE. To open Mocha Plus or Mocha Pro inside of After Effects the same way Mocha AE opens from After Effects, simply go to Mocha>file>preferences and open Mocha's preferences. Check "track in AE" and close Mocha. Restart After Effects and use Animation > Track in Mocha AE as you normally would. The Plus or Pro version of Mocha will now open the same way Mocha AE used to. Why won't Mocha 4 or License Manager run on a 32 bit system? hile older products supported 32 bit systems, Imagineer Systems license managers and Mocha v4 are 64 bit only moving forward. Where can I find more license and installation help? You can find more the license and installation guide here. If you are still having problems or need technical support, contact us. I am behind a firewall and can't activate my license, what should I do? If possible, turn off your firewall for a minute and activate online. Otherwise, you will need to send your Host ID and activation code into support for a manual license generation. If you have a floating license server, you will need to provide support with your HOST ID and SERVER NAME. Contact support now. Why am I getting the error code &#8220;Activation code does not match this product&#8221;? You most likely have the wrong program installed. Please make sure you install the exact product your activation code is for. This is found in your purchase email. Please note: If you are running the Adobe After Effects bundled version of Mocha AE,updates are provided by Adobe. Installing a download from the Imagineer site, requires an upgrade purchase. Still confused?Email us and we are glad to walk you through the options. How can I troubleshoot Mocha crashes? Troubleshooting suggestions: Restart your machine, usually a simple restart is enough to get any piece of software back on track. Make sure you have enough memory dedicated to Mocha in File>Preferences. Turn hardware rendering ON or OFF in File>Preferences, depending on your settings. Make sure your video card driver is up to date. Try running Mocha in 32-bit mode by using “Get Info” on the app and checking the 32-bit box. Why do I get &#8220;License error: Mocha AE CS6 must only be launched from After Effects&#8221; when I try to open videos on my computer? Why does Mocha crash immediately on startup or why can't I activate when I am using my thunderbolt ports on my new mac? Legacy versions of Mochaare not supportedondual monitor thunderbolt systems or systems with several thunderbolt ports in use. This was a known conflict with our FLEXlm license dependency and MAC Thunderbolt systems. This issue has been resolved in the latest version of Mocha V4. Please make sure you have Mocha V4.1.o or above installed on your machine in order to fix this issue. If you continue to have thunderbolt issues, please contact support. Why does my Wacom Tablet not work with Mocha? While this issue is fairly rare, you may need to update your Wacom Driver. Make sure you use a driver suited for your machine and that it is the correct driver for your exact tablet model. Why is my zoom tool not working? This is usually due to a non-English language keyboard layout (German, for example), or other possible keyboard mapping conflicts. Go to your Key Shortcuts tab in Preferences: In the Track shortcut category the keyboard shortcut you need to change/delete is “Track Luminance” In the Stabilize category the keyboard shortcut you need to change/delete is “Stabilize Y Translation On/Off”. You may also need to change “Remove Current Frame from Fixed Frames”. Can I customize my keyboard shortcuts in Mocha? Customizable keyboardshortcutsare now found in: MochaPro 4 and Mocha Plus 4.You can customize your keyboard shortcuts by going to File>Keyboard>Customize, or File>Preferences. Find out more here. Can I use custom frame rates with Mocha? Mocha does not support non-standard, custom frame-rates. You will need to use a different frame-rate, as close to your desired frame rate as possible, but convert your footage to individual frames instead of a movie. You will then be able to composite your shot and convert it to the proper frame rate of your choosing. Where did my cached renders go? When you render in Mocha, renders are temporary cached image files in your Results Folder. If you close Mocha and un-check “retain cached renders” on exit, Mocha will delete all the temp files. We recommend that you export your rendered results to another output folder with File>Export Rendered Clip for proper backup. Why can't I see my roto shapes, surface tool, or grid tool? Turn overlays on, that should fix the issue for you. Why does my surface tool disappear halfway through my track or why does my shape twist in on itself or scale off screen when I track? If you using perspective when you track, it may be that your surface is going behind the camera in Mocha and corrupting the data. In Mocha, problem splines can occur when the tracking data has become so skewed it goes off or “behind” camera, the keyframes the tracking data generates can throw the shape information out of order. You may need to re-track the shape using only translation, scale, rotation, and shear instead of perspective. Why does my shape not paste correctly into After Effects or Nuke? If your Mocha shape does not lineup in your destination software, you may have a mismatched project frame rate or aspect ratio. If you are seeing stranger results, the track for that shape may have become corrupt. A good way to check this is to turn the surface tool on and see if the surface tool does anything unexpected, like disappear. You may need to re-track the object. Why is my Mocha interface popping, jumping, jerking, or otherwise moving erratically? You likely need to update your graphics card driver. Please do to your video card’s support page and download the latest video drivers. Install the drivers and restart your machine. Why is my transform data off in After Effects when I paste it onto a null? If you are using Mocha3.2.1 and below only it is because the anchor point is also driving the null. Turn off the anchor point and your track and null should line up perfectly. InV4 we removedthe anchor keys for our AE Transform Data export. How do I optimize Mocha in my preferences? In Mocha Preferences (File>Preferences), you can increase RAM in the texture memory section, or turn hardware rendering on and off. Mocha needs at least a few GB of RAM and 100 GB of free hard drive space to render fast and trouble free. You can also view Mocha's technical requirementshere. What is the best way to work with interlaced footage? Mocha has the ability to interpolate interlaced footage. This must be set up when you start your new project: separate fields. Please note: For rendering modules such as Remove, Insert and Stabilize, interlaced footage can be difficult to work with. Imagineerrecommends working inside Mocha on frame based clips. Consider processing interlaced footage into frame based , de-interlaced footage in another program. You may then remove and render out of Mocha at full size, making the remove tool work easily in your shot. Why can I not track something that I know should be easy to track? Understanding the planar tracker is key to getting a good track. Increasing the Min % of Pixel Used in the track tab can also help. If your tracker is simply not working properly, there could bea corrupt file in your cache. Delete the contents of your cache folder. You can find your cache folder in your Preferences: File>Preferences wherever you have set it to, but usually somewhere like “C:/MoTemp/”. Delete the cache folder contents and restart Mocha. Why doesn't Mocha support my footage? Mocha from Boris FX supports most standard movie clip and image sequence formats. In order to use clips (ie. not image sequences) you must have QuickTime installed. Level of QuickTime support can vary depending on the operating system. View documentation: supported file list What to Do if Mocha Does Not Support Your Footage In the event that you are working in a format that Mocha doesn't support, we recommend converting the footage to an image sequence. Why is my track slipping? It may be because you do not notice an occlusion that Mocha DOES see; moving objects or people that slowly move in front of the area you are trying to track need to be avoided. Also look out for obvious or even “barely there,” consistently moving reflections or shadows; Mocha will notice them even if you don’t! But it could also be that you are not tracking enough or the right area of an object. Why doesn't my tracking or shape data line up from Mocha to my compositing or editing program? When you paste or importyour Mochadata into the final composite or edit, make sure you are pasting or loading your data in at the first frame of the clip, otherwise your data will not line up. Project settings such as frame rate, dimensions and pixel aspect ratio must be match between your Mocha project and your destination software.Make sure these values match the settings in your compositor or editor and inside of Mocha, otherwise your tracking data will not match when you export it. Why is my footage blank, black, white, or one frame long? There are certain types of codecs and file types that Mochadoes not support, usually native, unprocessed codecs off of cameras and AVIs on Windows. You mayneed to convert the file to something Mochasupports, such asquicktime or an image sequence. If your screen is black or white for clips but not for images, it is most likely the codec for the movie files that is causing the issue. View Documentation: supported file list Other troubleshooting tips: Double-check that your quicktime drivers, codecs, and video card drivers are up to date, and that quicktime can open the file. Why can I only export ten frames or why are all my renders watermarked?! You are running Mocha in learning edition (LE) mode. In LE mode, exports are limited to 10 frames andrenders have watermarks on them. LE mode exists so that you can continue to learn Mocha even after your 15 day trial has expired. If you are running on a floating license and you see the that you are running in LE mode, all your licenses have been checked out. If you have been working on a file on a node-locked license and you lose your license to another user, do not save your file in LE mode. How do I open Mocha AE that shipped with Adobe After Effects CS4-CS5? Open the Adobe After Effects program folder and launchthe Mocha AE. It is astandalone program. How do I open Mocha AE that ships with Adobe After Effects CS6 or Creative Cloud? Mocha AE ships free within Adobe After Effects CS4 through CreativeCloud. To launch, within After Effects: select the layer you want to track, go to Animation>Track in Mocha AE. How do I get started learning Mocha? The getting started page is a good place to begin your Mocha journey. You can also view the video tutorial section and browse by tag or date. Another great resource are Curious Turtle training videos. You can watch the free Mocha Fundamentals video series here or purchase downloadable materials. Other resources: On the training resource page, you can findlinks for authorized training partners and certified Mocha instructors. Q. I do not seemy product (monet, mokey, motor, etc) listed. Do you still sell it? A.Imagineer has either discontinued these products or merged all the functionality into Mocha Pro. If you own an older, no longer supported product and wish to upgrade toMocha Pro,please contact sales@imagineersystems.com team for a custom upgrade quote. Q: What is Mocha AE? A: Mocha AE is the bundled planar tracking and masking plug-in that has been licensed to Adobe since 2008, starting with CS4. Mocha AE CChas recently been updated in After Effects 2019. Select a layer and go to: Animation > track in Mocha Q: What is the difference between the new Mocha Pro 2019 and the Mocha AE CC that ships with Creative Cloud? A: Mocha Pro has many significant features not found in the Adobe bundled Mocha AE CC: Advanced Modules: Lens, Insert, Remove, 3D Solve, Stabilize GPU accelerated tracking and object removal Stereo 360/VR workflows Export data to industry standard systems For a full list, please view the product comparison chart. Q. Can you tell me about your support & maintenance contracts? A. Imagineer offers the option to purchase yearly support & maintenance contracts for Mocha Pro. This is ideal for customers that wish to insure they are always running the latest version or need guaranteed response time for customer support & technical issues. Most sites purchasing multi-seats or floating license take the support option. 1 year support contracts include: Free upgrades to major releases Minimum 1 business day response for all technical support cases. Mocha Pro version 5 has new features for hosts like Blackmagic Fusion, Autodesk Flame, and HitFilm. Q. How many computers can I install a license on? A. Mocha Pro 5now has an improved license system allowing users to activate or deactivate their software license while connected to the internet. This allows a user to install the software on multiple systems, then "activate" the Mocha Pro 5license on their computer of choice. Simply "deactivate" your license to move it to a new system. Customers not connected to the internet should contact our support team for manual license transfers.